It wasn't enough for the editors here at HuffPost merely to report that Pizza Hut is releasing limited quantities of eau de Pizza Hut. We had to take it one step further -- and actually sample the scent. 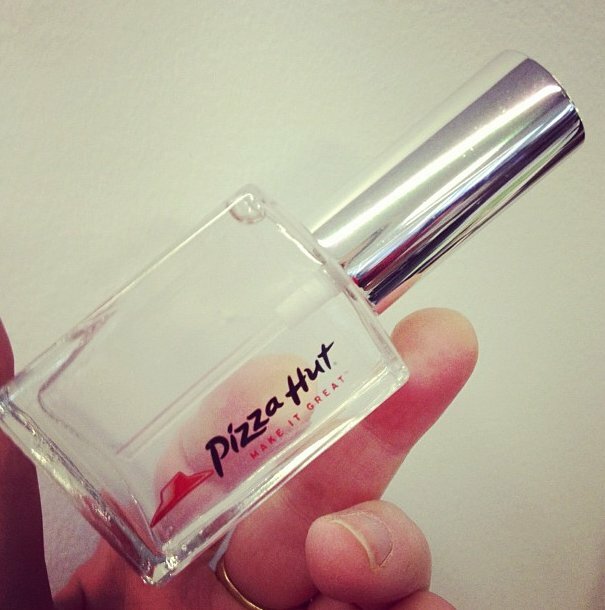 Pizza Hut is right about one thing: The perfume definitely smells like dough. However, the similarities between the smell of pizza and the smell of this perfume end there. Among the eager samplers in the HuffPost newsroom, there was unanimous agreement that rather than pizza, the perfume smelled like cinnamon rolls. And not just any cinnamon rolls, mind you. The Pizza Hut perfume smells exactly like Cinnabon. We've got to hand it to Pizza Hut -- we were expecting something pretty gross, and the Pizza Hut perfume actually (almost) smells rather pleasant. But it just ain't pizza. There's no tomato sauce or cheese smell. Now, if you'll excuse us, we're on the lookout for something sweet.